This was one of my early oil paintings 9 years ago, based on my childhood memory. I would never have found a better way to express my feelings! That is why I haven't painted it over. Beautiful reason, purpose and painting. I am glad you decided to paint again!!! The world is a much richer place for that decision. Switching to oil 12"x12". Beautiful and warm after days of rain. There were many free range chicken, who were huge and friendly. They knew they could get food from people I believe. No food from me today. 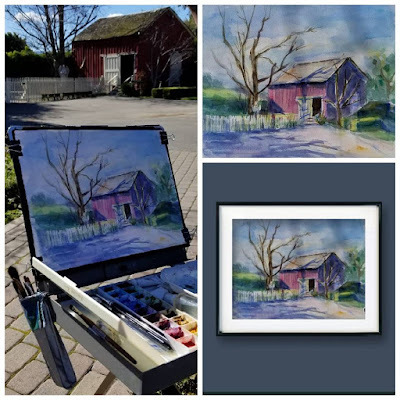 First time plein air at Emma Prusch Farm Park, San Jose, CA, and the first time I painted out in oil, I had to concentrate. Still they were cute, I took some photos for future painting project😊. This property, Carson House, located at Almaden historic district, San Jose, California. It has been placed on the National register of Historic Places by the United States Department of the Interior. The one I painted was based on the sketches I did on Christmas day 2017. After the painting was done, I did some research to view the old photos, and realized that there was no cactus in front of the house. I wonder how old those cactus are. The red color fruits on the cactus are very beautiful too. It made me really want to visit this museum as well, but it was closed. Next time I will make it. 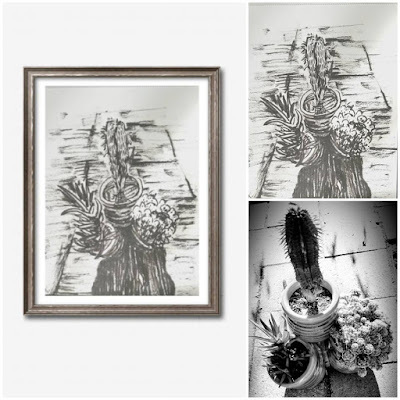 Today the morning light on my little cacti with shadow grabbed my attention, here is my sketch. 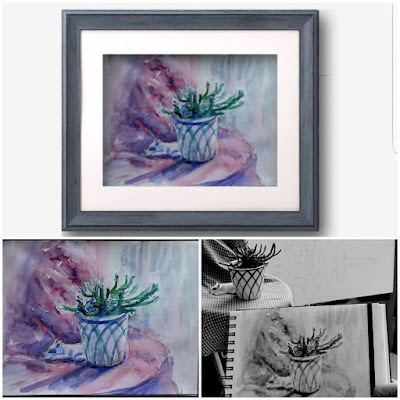 I never thought I would like sketching or painting plants. Now, I have found that I actually enjoy watching and drawing them. 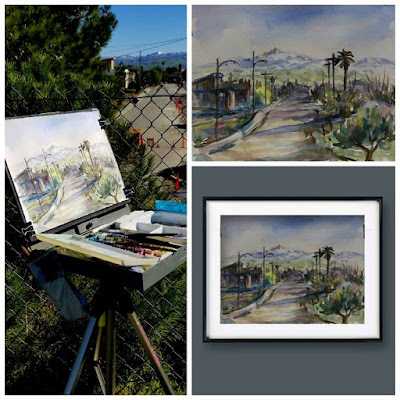 Painting outdoors is great, but it takes extra hour(s) on the road most of the time. I've noticed that there are so many subjects I could do just surrounding me in my daily life. I don't think I would run of painting ideas for sure, not mention my endless imagination... Paint daily is a necessary exercise, and it is very important for being an artist, don't you agree? 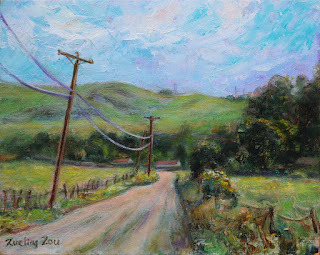 Drove down to the location, I was attracted by the red barn for my landscape plein air. It was on a private property, so the best I could do was drag my outdoor painting stuff through the grass making a fresh spring trail. It was a beautiful sunny breezy day after days of rain. I saw the cows grazing off in the distance on the rolling hills, and could hear their lowing. There were rosters and hens song drifted by from the nearby villages, What a peaceful morning in the countryside in California! 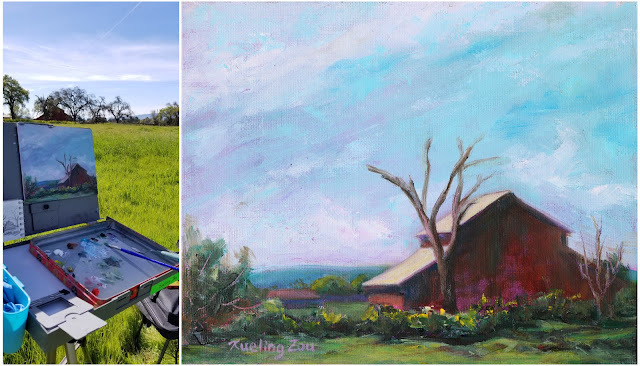 I enjoyed painting the trees and the red barn I liked and ignoring other things I didn't want them in my work. Yes, I'm proud that I am able to have the freedom to be a creative artist instead of copying others, or copying what have been seen in exact sense. My painting went smoothly, I didn't have to retouch much after returning home. 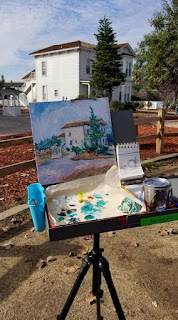 Cold early morning, about 35 degrees, went to the South Bay Yacht Club for outdoor painting. I always love to paint boats. But I painted a landscape today instead, just because we rarely see snowy mountains in Silicon Valley. Felt like I was painting somewhere else. I will go back to that location to paint boats other days for sure. It was quite windy. The one I've posted here was the first one I painted at dusk. I tried to loosen up and paint another one, it was the sunset time, I wasn't able to finish. I have been thinking to paint here for so long, finally Robyn and I we made it. Always happy to paint with another artist. Raining Sunday, painted a still-life at home. I am a little crazy about succulent plants and have collected many. Most of them I don't remember the names of. Liked the one I painted today, it grew like a chrysanthemum flower. Do you know this plant's name by any chance? I brought it in from the rain. Used a piece of clothing from my dirty laundry, so I didn't need to do extra washing, just as simple as it looked. It was a gray, cold and rainy day. Went to a local artist's house for painting. It was a beautiful property with gorgeous landscaping. Hard to make a decision where to paint... Painted from this angle, I could imagine if it were a sunny day, the light and shadows could make a big difference. 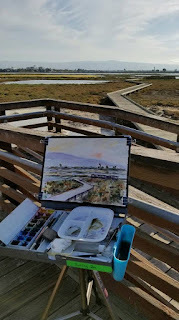 My watercolor refused to dry, so I had to stop... And we had a delicious lunch there. Thanks very much for such great hospitality! 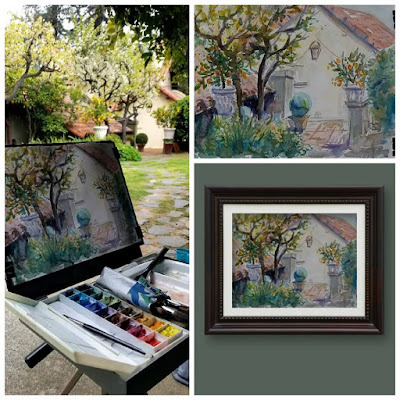 First time painting at the Winchester Mystery House, San Jose, CA. I've passed by it countless times, never thought it was an interesting place to paint. Actually, not only it was worth a visit, it is also a beautiful spot - a gorgeous mansion surrounded by lovely landscape. It was cold in the morning, but the light and shadows in winter had become unique shapes and contrasts. 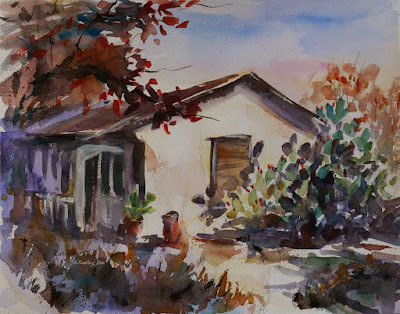 I would like to go back to paint again as today, I didn't paint the main building. ALL MY ART PIECES ARE REGISTERED COPYRIGHT WITH ALL RIGHTS RESERVED: ©Xueling Zou.